I see that I must strengthen the glutes and the upper back muscles. Since what I need is enduring strength rather than max strength I must exercise these muscles with low load for many reps. To make things simpler I want a program that takes approximately 15 minutes and consists of as few exercises as possible (preferably 3 or less). Also the exercises should ideally easily be done at home without large equipment. I already train with heavy barbells twice a week so I was planning on doing these exercises all the other days. In addition I train interval running once a week and go for walks so my heart is fine. Its just some of my muscles that are weak and some that are tight. I have very thight hips and this is a problem when I squat so lately I have been doing monster walks and sideways walks with resistance bands as a warmup to my weight training and this is something I enjoy as I feel that it really opens up the hips. I also tried the banded bodyweight squat to reverse lunge and I liked that exercise since it reinforces the squat pattern and seems very effective for the glutes (I could really feel the "burn"). Also before starting heavy barbell training I did some training with kettlebell two hand swings. I dismissed it as not as effective way to gain strength as barbell training but now I am thinking that doing lighter kettlebell swings almost every day may be a good thing for the posterior chain. Having one kettlebell at home is fairly practical, it does not take a lot of space. Even if weak ab muscles are not shown in the figure above I think this is a problem. When standing we must have some pressure in our abdomen. When sitting none. So I think the plank should be one of the exercises. I already know that I am terrible at it so it sounds like something I need. Regarding the upper back mucles it is somewhat more difficult to find a practical exercise for this. Kettlebell or dumbell bent ower row is one option but that takes twice as long since each arm has to be trained separately. I am fortune enough to be member at a gym that is located 100 m from my apartement so I am considering using one of their rowing machines for this. I have read that rowing trains 83% of the muscles in the body. Not sure if this means that just rowing 15 mins a day on its own might be good enough exercise to offset the adverse effects of sitting? This would certainly fit the simple program criteria. Edit: After having researched a bit it seems both kettlebell swing and rowing machine are great exercises but they have one problem; they both tend to tire the lower back. Because of this it is difficult to do them everyday. Body weight squats and the plank on the other hand seem to be something that can be done every day. I don't think there is any respected scientific evidence that will tell you the minimum set of resistance to reverse the effects of sitting, specially in a time restriction of 15 min and 3 or less movements. If you are sitting for 8 hours a day or more (I do), nothing you can do in 15 min will reverse the negative effects of sitting. So that is out of the window. Also, you don't have to just deal with muscular/posture issues due to sitting - you also need to deal with cardiovascular issues. What you can do is offset those negative effects at least partially. Another approach is to move more and sit less. What you really trying to combat is an inactivity due to work environment. Maybe you can invest in a standing desk? Maybe you can go for a walk at lunch? Do something you like doing! Your approach in the question is very methodical. "Biggest bang for the buck in shortest time", so to speak. Nothing wrong with that, by the way. Another approach would be something like this: instead of doing some prescribed movement for 15 min every day because you have to, how about you find something physical to do because you want to. Do you like biking? - go for a ride. Running? - go for a run. Squash? - play a game of two! Yoga? - do that!. That way you will be spending time doing something you want to do, instead of something that you have to do. And, who knows, maybe you will spend more time doing it because it is more meaningful and fun. If we really have to honour the constrains of the question, namely "15 min; <= 3 movements; every day", I would do some variation of big compound movements. The more muscle you recruit - the better. Full body HIIT movements ( there are a lot of workouts online) would probably be a good option as they squeeze more volume in shorter amount of time. Use a wide stance since this emphasizes the glutes instead of the quads. Pause a bit in the bottom position, this will stretch your thight hips. 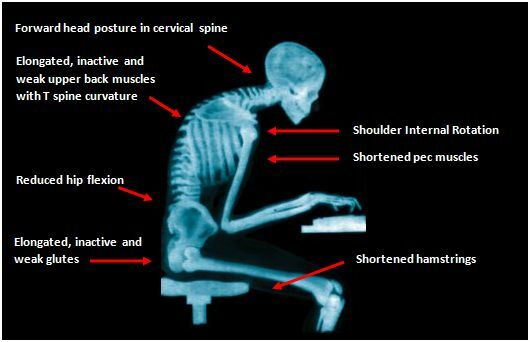 Sitting causes anterior pelvic tilt and weak abs. The key point when doing this is a straight back. To achieve this you have to rotate your pelvis out of the anterior pelvic tilt. That is flatten your lower back. Likewise you have to flatten your upper back out of the hunching position. Doing this exercise correctly with a straight back is much heavier than doing it with a hunched back and anterior pelvic tilt. You can use this as a cue; search for the most intense position. Not the answer you're looking for? Browse other questions tagged posture resistancetraining or ask your own question. Best way to achieve muscle activation in the lower abs? What is a good (indoors) exercise regiment for a computer scientist?